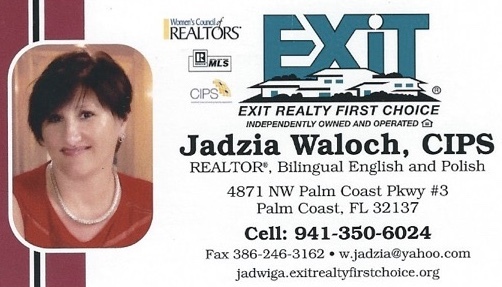 Jadzia Waloch is a Polish Realtor in Flagler County, Florida and she serves clients from all over Florida, especially from Flagler County, Volusia County and St. Johns County including Palm Coast, St. Augustine and Jacksonville area. She also serves as a certified court translator for Polish language and as a notary public providing a wide range of notary services including marriage ceremonies. 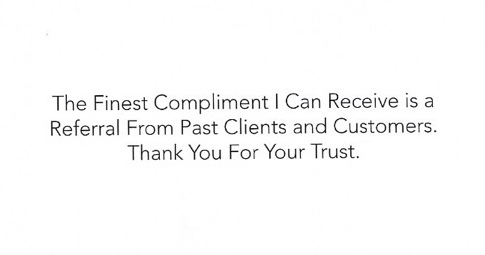 Jadzia is fluent in Polish and can help you with all kinds of real estate, translation and notary public needs. “I have been living in Palm Coast for the past 12 years. I’m proud to assist buyers, sellers and investors with properties in the town of Palm Coast and surrounding communities. This area has experienced incredible growth in past 10 years, and has become one of the most desirable areas to leave in. With my Certified International Property Specialist designation, I help simplify what can be a difficult process for buyers and sellers from other countries. I obtained my license in 2015 and Notary Public since 2002 CSA-certified. My knowledge in closing can provide important information to the buyers and sellers. I am fluent in Polish. I received the United States Army Europe and Seventh Army Scroll Appreciation award in 1992 and Department of the Army Quality Service Training in 1987. I’m proud to be a part of the EXIT REALTY FIRST CHOICE team; a company with a reputation in the community as a hands-on, people-oriented business. We follow the example set by EXIT REALTY CORP. International, the only national brand created after the internet age, which has re-invented real estate by providing a high-tech, high-touch philosophy that always puts people first. When I take time off, you will find me traveling to different places and countries. Jadzia Waloch jest polską pośredniczką nieruchomości w Flagler County na Florydzie. Jadzia pomaga klientom z całej Florydy, a w szczególności w rejonie Flagler County, Volusia County i St. Johns County, w tym Palm Coast, St. Augustine and Jacksonville. Jadzia pracuje również jako certyfikowany tłumacz sądowy języka polskiego oraz notariusz. Jadzia oferuje szeroki zakres usług notarialnych, w tym udzielanie ślubów. Jadzia mówi biegle po polsku.